Has this happened to you? There is something you must remember. You remind yourself over and over about the thing. Yet when the time comes to take action, that thing completely slips your mind. When the opportunity for action has passed, you remember it again and mentally (maybe out loud too) beat yourself up for being so forgetful. Or you lose something. You look high and low for it but it's nowhere to be found. Later you find it in some obvious place. 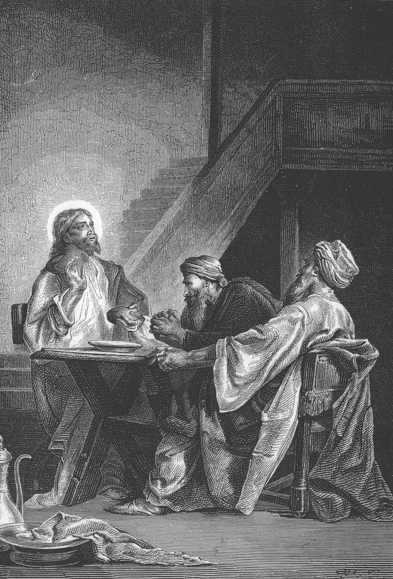 I think of the two Emmaus disciples when things like the above happen to me. Like them, I have begun to suspect that sometimes my eyes are supernaturally "restrained." But I think God blinded their eyes to Jesus' identity intentionally. Think of the teaching they would have missed if they had recognized Him right away and returned excitedly to Jerusalem at the beginning of their journey. "And beginning at Moses and all the Prophets, He expounded to them in all the scriptures the things concerning Himself" - Luke 24:27. Think of the companionship and sweet fellowship experience of that afternoon walk with their risen Saviour and how this personal interaction with Jesus will give heart and warmth to their testimony. "He took the five loves and the two fish and looking up to heaven, He blessed and broke them and gave them to the disciples to set before the multitude" (of 5,000) - Luke 9:16. "And He took the seven loaves and the fish and gave thanks and broke them and gave them to His disciples; and the disciples gave it to the multitude (of 4,000) - Matthew 15:36. I try now, when I sense my eyes have been restrained, to ask for insight into what I am to learn. For I believe God is in our times of restrained sight as much as in our times of illumination. PRAYER: Dear Jesus thank You for this tender story that I can relate to so well. Help me to understand that even my apparent mess-ups—forgetting things, losing things—can turn out to be blessings from You. Amen.